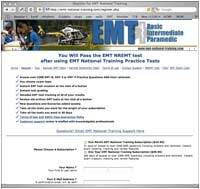 How does the testing work at EMT National Training? New NREMT Exam Simulation Mode! Along with our proven testing system we are now offering the new NREMT simulation examination that delivers one question at a time just like the newest assessment examinations from the NREMT! All exams are timed and deliver the exact same percentages of questions per topic as the NREMT. Better yet, your exams are instantly graded and you are given a percentage breakdown by topic so you know exactly how you scored in each area (just like the NREMT used to give you) Register now and be taking practice tests in minutes! Registering to use the site is easy and secure. Just click on any of the register links and you will be transferred to our sign-up page. There you will choose what testing level you would like EMT-B, EMT-I or Paramedic, enter your billing information and choose your login and password. 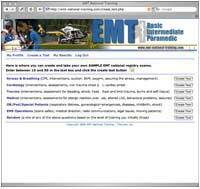 Click on "Create an Exam" and you are transferred to the EMT practice test creation page. 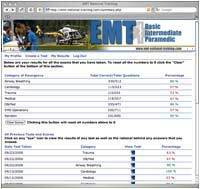 Here you are able to choose how many questions you would like to test on (between 10 and 30) as well as the category of EMT exam you would like to take. 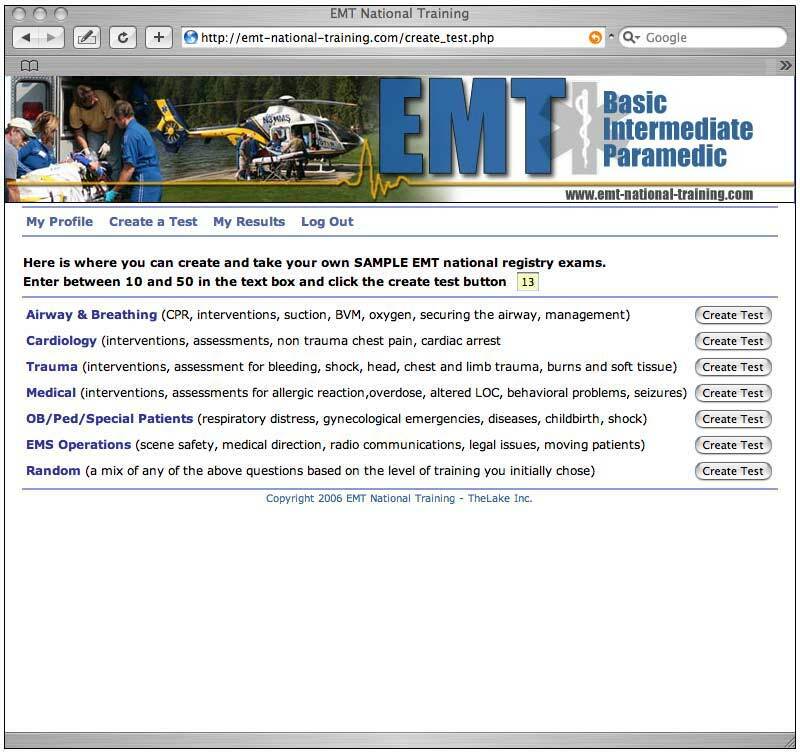 Click the "Create Exam" button and the test is created online from our continually growing database of over 2650+ EMT questions and scenarios. Read and complete each test question carefully by clicking on the appropriate answer. At the bottom of the test page is the "Grade Exam" button. Click this button and your EMT test is instantly graded and displayed. Each test you take is displayed with the correct answers AND rationale. Learn WHY you got a question wrong and you will be prepared for similar questions on future tests. After reviewing your exam, click on the "My Results" link at the top of the page. 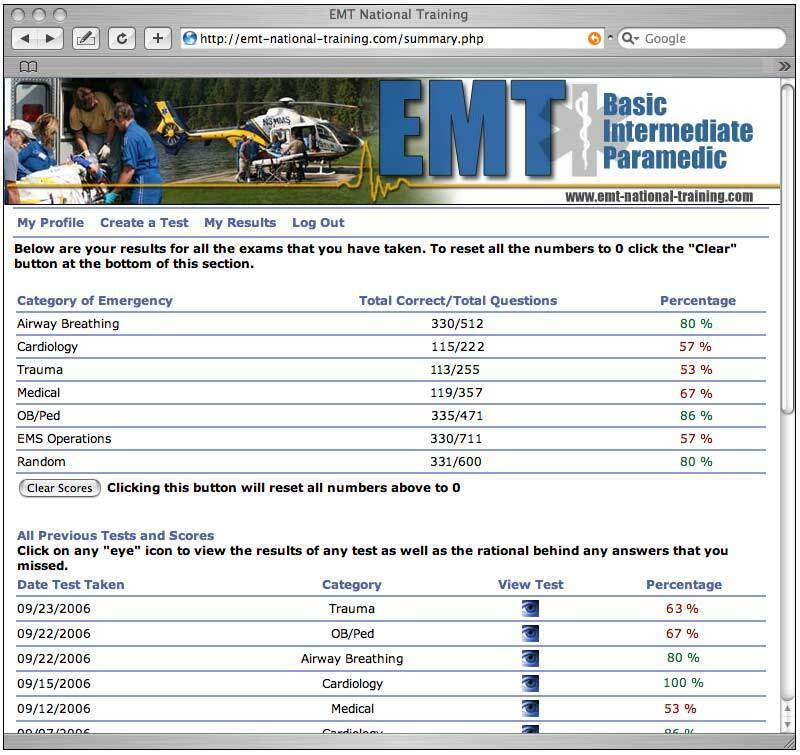 Your results page will track each practice test that you take as well as display what your correct answer to question ratio is for each of the particular categories of EMT tests. You can clear this information at anytime for a fresh start by clicking the "Clear Scores" button or the "Clear Tests" button. Register Now and be taking EMT exams in minutes! EMT National Training has assisted over 53,000 EMTs and Paramedics with their NREMT exams. Did they all pass? No, but those who utilized our product properly and scored well on their practice exams, likely did pass. The only complaints we ever hear from subscribers about not passing their NREMT exam is when the subscriber has not utilized our product properly. So this begs the question; How does a subscriber utilize EMT National Training properly? 1. Take 1500 questions minimum. Covering all categories thoroughly. 2. Take enough time to use our practice exams. That length of time is going to vary depending on how much time you have available. If you can take 1500 questions minimum in 7 days...great. If you can take 3000 questions in a month...even better. 3. Read the rationale for each question... especially if you get the question wrong. You will learn more from reading the rationale than you will from answering the question. 4. Score well on your practice exams. If you are consistently scoring above 80% in all categories then you should feel comfortable that you know your stuff well enough to pass the NREMT exam.